From Oakland: Take highway 24 East, through the tunnel. Pass town of Orinda. Take Mt. Diablo Blvd./Acalanes exit. Go through stop lights onto Mt. Diablo Blvd. Pass the Lafayette Reservoir on the right. Drive approximately 1/8 mile further. Turn left on Risa Rd. Take the first right which is Woodbury Rd. On your right you’ll see another Woodbury Rd. sign but DO NOT turn here. Go STRAIGHT up the hill to the very end . (Please refer to the photo on this page). Swing right at the top of the hill and look for building #3746 on your right. Suite #200. From Walnut Creek: Take highway 24 West. Take Central Lafayette exit. At the light, turn left on to Deerhill Rd. 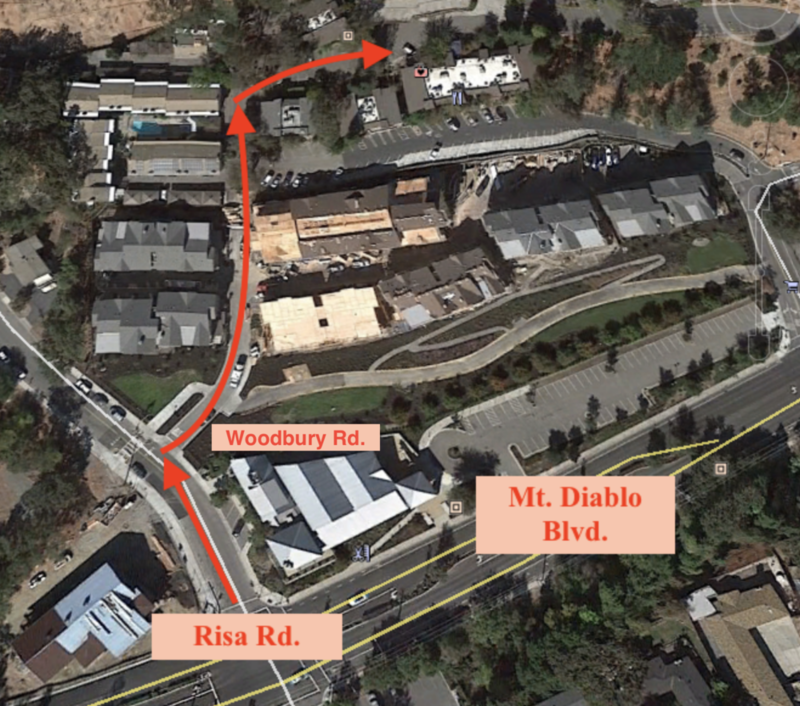 When Deerhill ends (past the BART station), turn left onto Happy Valley Rd. Drive one block. Turn right onto Mt. Diablo Blvd. Drive approximately 1/2 mile and turn right on Risa Rd. Take the first right which is Woodbury Rd. On your right you’ll see another Woodbury Rd. sign but DO NOT turn here. Go STRAIGHT up the hill to the very end . (Please refer to the photo on this page). Swing right at the top of the hill and look for building #3746 on your right. Suite #200. By BART: Exit at Lafayette BART station. Walk one block south to Mt. Diablo Blvd. Go right on Mt. Diablo Blvd and use the directions above. Walking from BART will take 15 to 20 minutes.